C S Lewis has been hailed as one of the greatest Christian thinkers of the twentieth century. Now, for the first time, a comprehensive selection of quotes has been compiled from his complete published works. 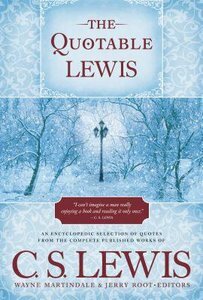 Arranged alphabetically by topic and ordered chronologically within topics, THE QUOTABLE LEWIS shows the progression of Lewis' thought. Quotes arranged alphabetically by topic and chronologically within topics, showing the progression of Lewis's thought. Also includes photographs of Lewis and his circle. This book presents more than 1,500 quotes from Lewis's writings, providing ready access to his thoughts on a variety of topics. An exhaustive index references key words and concepts, allowing readers to easily find quotes on any subject of interest. Also included are many photographs of Lewis and his close circle of friends.^Quick summary: ^More than 1,500 quotes from Lewis's writings. Sixteen pages of photographs. Extensive index and numbering system. H. Wayne Martindale (Ph.D., University of California, Riverside) is Professor of English at Wheaton College where he regularly teaches classes on C. S. Lewis. He has edited and contributed to books on Lewis such as Beyond the Shadowlands: C.S. Lewis on Heaven and Hell (Crossway Books, 2005); A Family Guide to Narnia: Biblical Truths in C.S. Lewis's The Chronicles of Narnia (with Christin Ditchfield); Journey to the Celestial City: Glimpses of Heaven from Great Literary Classics (Moody) and is co-editor of The Quotable Lewis and The Soul of C. S. Lewis with Jerry Root and Linda Washington. Dr Martindale spends much of his time lecturing in China through the Wheaton-in-Asia program where he teaches a quad course on Asian Literature (autobiography). Jerry Root (Ph.D., British Open University, Oxford Centre for Mission Studies) has taught college and graduate courses on Lewis every year since 1980 as well as lecturing on Lewis throughout America and many other countries. He is a coeditor of The Quotable C. S. Lewis and also the author of C. S. Lewis and a Problem of Evil: An Investigation of a Pervasive Theme. He teaches at Wheaton College in Illinois and at Biola University in Southern California.